The brown recluse spioder is commonly referred to as "fiddleback" spiders or "violin" spiders and is a reclusive creature that seeks and prefers seclusion. They can even survive long periods of time - up to 6 months - without food or water, and they only bite when crushed, handled, or disturbed. The brown recluse spider spins a loose, irregular web of very sticky, off-white to grayish threads which serves as the spider's daytime retreat and is often constructed in an undisturbed corner. During daylight hours, brown recluse spiders typically retreat to dark, secluded areas. The female seldom ventures from their retreat, whereas males and older juveniles are more mobile and tend to travel farther. Consequently, they are more likely to wander into shoes, clothing or bedding at night and bite people when they inadvertently become trapped against the skin. At times, brown recluse spiders will be seen during daylight hours crawling on floors, walls and other exposed surfaces. Such behavior can be triggered by hunger, overcrowding, pesticide application, or other factors. 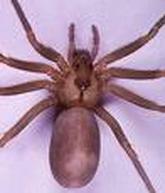 The brown recluse generally occupies dark, undisturbed sites, and can live both indoors and outdoors. In favorable habitats, their populations are usually dense and they thrive in human-altered environments. Indoors, they may be found in attics, basements, crawl spaces, cellars, closets, and ductwork or registers. They may seek shelter in storage boxes, shoes, clothing, folded linens, and behind furniture. They also may be found in outbuildings such as barns, storage sheds, and garages. The reaction to a bite from the brown recluse depends on the amount of venom and the person's sensitivity to it. Some are unaffected by a bite, whereas others experience immediate or delayed effects as the venom kills the tissues at the site of the bite. Many brown recluse bites cause a little red mark and the vast majority of brown recluse bites heal without severe scarring. Initially, the bite may feel like a pinprick and can go unnoticed for 2 to 8 hours. On rare occasions, victims experience restlessness, itching, fever, chills, nausea, vomiting, or shock. A small white blister usually rises at the bite site surrounded by a swollen area which enlarges, becomes red, and is hard to the touch. The lesion from a brown recluse spider bite is a dry, blue-gray or blue-white, irregular sinking patch with ragged edges and surrounding redness--termed the "red, white, and blue sign." The lesion usually is 1½ inches by 2¾ inches or smaller. The bite can result in a painful, deep wound that takes a long time to heal. Fatalities are extremely rare, but bites are most dangerous to young children, the elderly, and those in poor physical condition. When there is a severe reaction to the bite, the site can erupt into a "volcano lesion" (a hole in the flesh due to damaged, gangrenous tissue). The open wound may range from the size of an adult's thumbnail to the span of a hand. The dead tissue gradually sloughs away, exposing underlying tissues. The sunken, ulcerating sore may heal slowly up to 6 to 8 weeks. Full recovery may take several months and scarring may remain. If bitten, remain calm, and immediately seek medical attention. Apply an ice pack directly to the bite area to relieve swelling and pain. Collect the spider even if it is mangled for positive identification (misdiagnosis can delay proper treatment). A plastic bag, small jar, or pill vial is useful and no preservative is necessary, but rubbing alcohol helps to preserve the spider.